So, recently, the North West Digital Radio group generously donated a UDRC II radio control board in thanks for my initial work on an audio driver for the Texas Instruments TLV320AIC3204 (yes, a mouthful). This board looks like it might support the older Pi model B I had, but I thought I’d play it safe and buy the later revision, so I bought version 3 of the Pi and the associated 7″ touch screen. 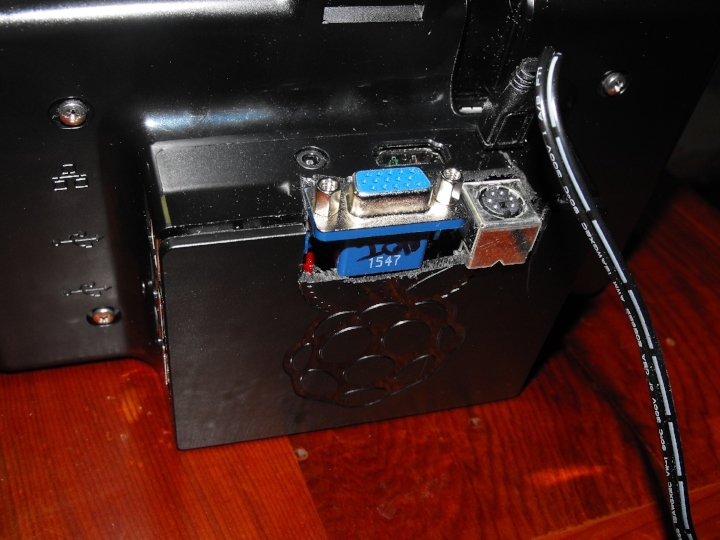 Thus, an order went to RS for a whole pile of parts, including one Raspberry Pi3 computer, a blank 8GB MicroSD card, a power supply, the touch screen kit and a case. To fit the UDRC, the case will need some of the plastic cut away, rectangular section out of the main body and a similarly sized portion out of the back cover. When assembled, the cut-away section will allow the DB15-HD and Mini-DIN6 connectors to protrude out slightly. The UDRC needs some minor modifications too for the touch screen. 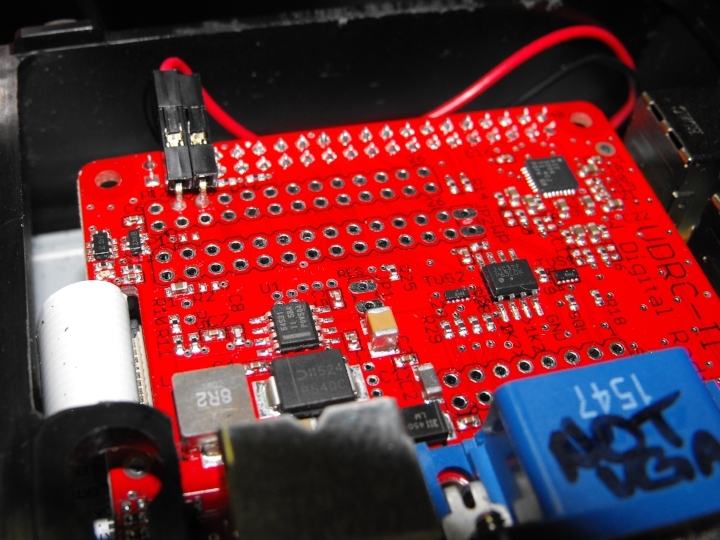 Probe around, and you’ll find a source of 5V on one of the unpopulated headers. You’ll want to solder a two-pin header to here and hook that to the LCD control board using the supplied jumper leads. If you’ve got one, use a right-angled header, otherwise just bend a regular one like I did. You’ll note I’ve made a note on the DB15-HD, a monitor does NOT plug in here. From here, you should be ready to load up a SD card. NWDR recommend the use of Compass Linux, which is a Raspbian fork configured for use with the UDRC. I used the lite version, since it was smaller and I’m comfortable with command lines. If you try to boot your freshly prepared SD card, the first thing you’ll notice is that the screen is up-side-down. Clearly a few people didn’t communicate with each-other about which way was up on this thing. # Rotate the screen the "right way up"
Now save the file, unmount the SD card, and put it in the Pi before assembling the case proper. Now, if you chose the lite option like I did, there’ll be no GUI, and the touch aspect of the touchscreen is useless. You’ll need a USB keyboard. Log in as pi (password raspberry), run passwd to change your password, then run sudo -s to gain a root shell. You might choose like I did to run passwd again here to set root‘s password too. After that, you’ll want to install some software. Your choice of desktop environment is entirely up to you, I prefer something lightweight, and have been using FVWM for years, but there are plenty of choices in Debian as well as the usual suspects (KDE, Gnome, XFCE…). For the display manager, I’ll choose lightdm. We also need an on-screen keyboard. I tried a couple, including matchbox-keyboard and the rather ancient xvkbd. Despite its age, I found xvkbd to be the most usable. Once you’ve decided what you want, run apt-get install with your list of packages, making sure to include xvkbd and lightdm in your list. Other applications I included here were network-manager-gnome, qasmixer, pasystray, stalonetray and gkrellm. Having installed lightdm and xvkbd, you can now configure lightdm to enable the accessibility options. Open up /etc/lightdm/lightdm-gtk-greeter.conf, look for the line show-indicators and tack ;~a11y on the end. Now down further, look for the commented out keyboard setting and change that to keyboard=xvkbd. Save and close the file, then run /etc/init.d/lightdm restart. You should find yourself staring at the log-in screen, and lo and behold, there should be a new icon up the top-right. Tapping it should bring up a 3 line menu, the bottom of which is the on-screen keyboard. The button marked Focus is what you hit to tell the keyboard which application is to receive the keyboard events. Tap that, then the application you want. To log in, tap Focus then the password field. You should be able to tap your password in followed by either the Return button on the virtual keyboard or the Log In button on the form. Rather than showing how to do it from scratch, I’ll just link to the configuration tarball which you are welcome to play with. 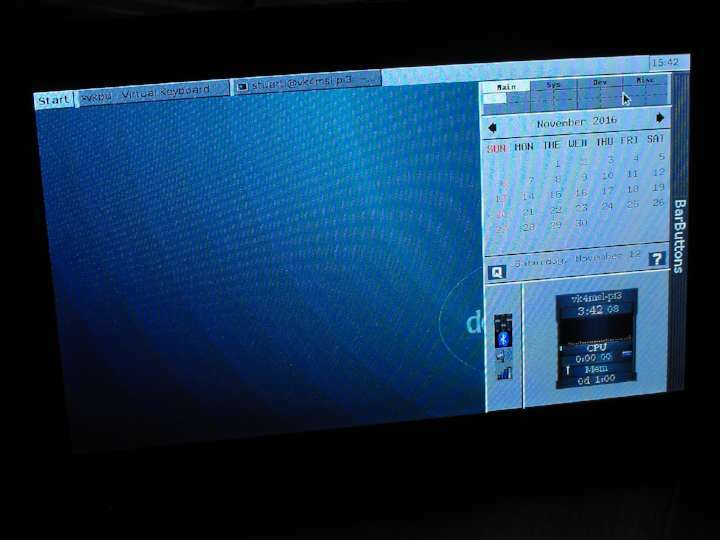 It uses xcalendar which isn’t in the Debian repositories any more, but is available on Gentoo mirrors and can be built from source (you’ll want to install xutils-dev for xmake), stalonetray and gkrellm are both in the standard Debian repositories. This took a bit of hunting to figure out. 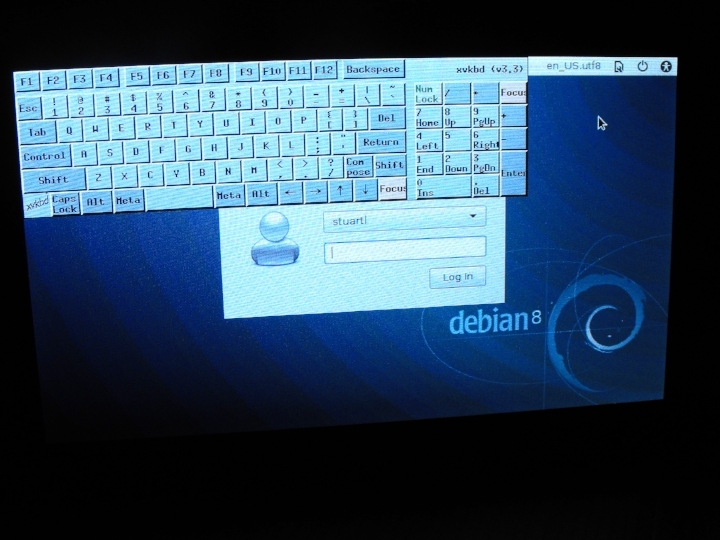 There is a method that works with Debian Wheezy which allows right-clicks by way of long presses, but this broke in Jessie, and the 2016-05-23 release of Compass Linux is built on the latter. So another solution is needed. Philipp Merkel however, wrote a little daemon called twofing. Once installed, doing a right click is simply a two-fingered tap on the screen, there’s support for other two-fingered gestures such as pinching and rotation as well. It is available on Github, and I have forked this, adding some udev rules and scripts to integrate it into the Raspberry Pi. The resulting Debian package is here. Download the .deb, run dpkg -i on it, and then re-start the Raspberry Pi (or you can try running udevadm trigger and re-starting X). The udev rules should create a /dev/twofingtouch symbolic link and the installed Xsession.d/Xreset.d scripts should take care of starting it with X and shutting it down afterwards. Having done this, when you log in you should find that twofing is running, and that right clicks can be performed using a two-fingered prod. Having done the configuration, you should now have a usable workhorse for numerous applications. 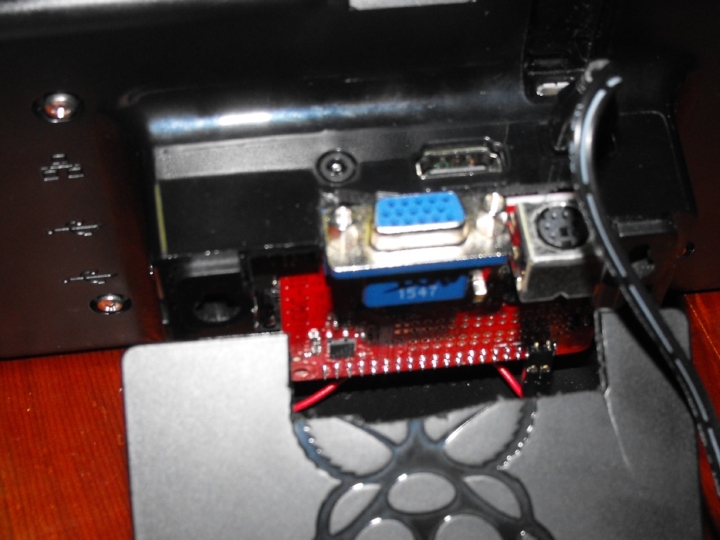 The UDRC shows up as a second sound card and is accessible via ALSA. I haven’t tried it out yet, but it at least shows up in the mixer application, so the signs are there. I’ll be looking to add LinBPQ and FreeDV into the mix yet, to round the software stack off to make this a general purpose voice/data radio station for emergency communications.